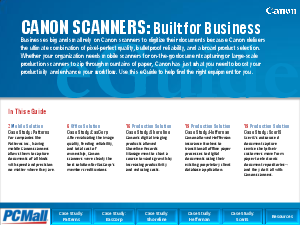 Businesses big and small rely on Canon scanners to digitize their documents because Canon delivers the ultimate combination of pixel-perfect quality, bulletproof reliability, and a broad product selection. Whether your organization needs mobile scanners for on-the-go document capturing or large-scale production scanners to zip through mountains of paper, Canon has just what you need to boost your productivity and enhance your workflow. Use this eGuide to help find the right equipment for you.